For the first time in many years the sun shone on the North Island Bull Trial Sale. It was the first trial at the new Limax Enterprises property on the slopes of the Kaimais, near Matamata. 15 R2YO bulls were presented in excellent order by five North Island Studs: Ngarimu, Huntlands, Mangatawhiri, Grayleen and Kivlean. 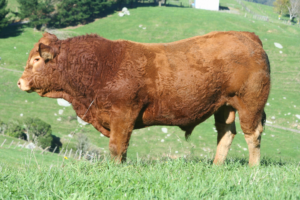 The top price of $7200 was paid for Ngarimu Lancelot by life members of Limousin New Zealand, Allan and Mary McKenzie, Caberfeidh Stud from Wellsford. 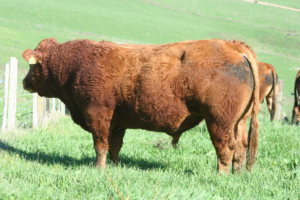 Lancelot is homozygous polled with the usual two copies of the F94L muscling gene. His sire, Grayleen Ferdinand, (a product of the 2012 Bull Trial) produced the first four placings in the Bill Austin judging of the trial group of 15. The Dam, Snake Gully Fizzle is a Romn Tow Truck daughter. $5000 was paid by Wayne and Jocelyn Crombie ‘Brondelwayne’ for Ngarimu Lincoln . Wayne and Jocelyn are regular buyers at the trial sale and have an eye for quality bulls. Lincoln’s sire was again Grayleen Ferdinand with his Dam being a Ngarimu dominated cow. Eleven of the fifteen bulls sold with an average price of just over $4000.